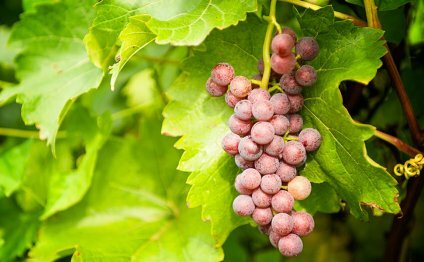 For best results, plant your grape vines in the spring. Once your plants arrive, plant them immediately. If you cannot plant immediately, keep new arrivals cool and roots moist. To keep cool, it is recommended that you store in refrigerator or cool place. Keep new arrivals cool and roots moist. Rehydrate the roots by soaking in water for a few hours just before planting, Have your vine supports in place before planting. You can use a stake if no other support is available. Dig a wide, deep hole, so roots can be spread out completely. Cut off broken roots. Plant at the same depth as in the nursery, 6'-8' apart. Insert the stake carefully, so you do not injure the roots. Right after planting, prune back to the best cane with 2-3 healthy, living, fat buds (nodes). After the danger of spring frost is over and shoot growth begins, remove all but two of the strongest shoots. Remove all the flower clusters this first growing season. The goal in the first year is to establish the plant with strong roots and a straight trunk. Water after planting. For best results plant your raspberry bushes in early spring. Once your plants arrive plant them immediately. If you can’t plant immediately keep new arrivals cool and roots moist. To keep cool it is recommended that you store in refrigerator or cool place. Unpack and Soak: Unpack grape vine and soak in water for 3 to 6 hours just before planting. Dig Hole(s): The width of the hole should allow you to spread roots. If you are planting multiple grape vines dig holes 6'-8' apart. Shovel Dirt Back in Hole. Water: Give each plant 1"-2" of water. The plants are rather shallow rooted, so moisture needs to be at the surface. Do not let soil become dry to a depth of 6". Water regularly the first year about 1" a week. Directly moisten the roots. Do not spray or mist. After the vines are established, they seldom need watering. Overwatering causes leaves to drop. Mulching is not necessary after the vines are established.